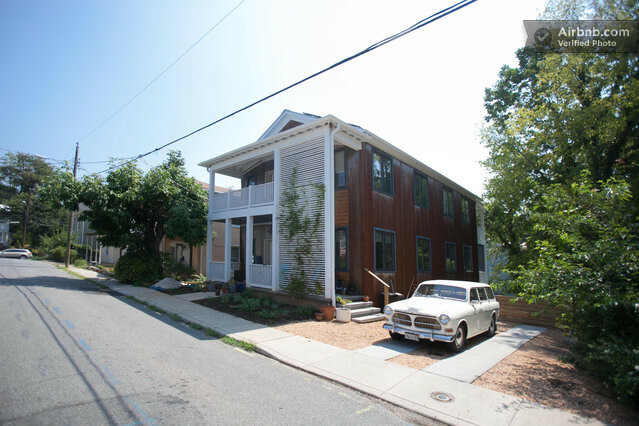 Think Little consulted with Jeff Erkelens and Joey Conover from Charlottesville design-build firm Latitude 38 for their own house and home office, a Passive House in Charlottesville’s Fifeville neighborhood. Stepping up to Passive House wasn’t a big jump for Jeff and his crew. They were already regularly achieving 1.0 ACH50 on the blower door tests for the three previous EarthCraft-certified houses that I had worked on with them. We suggested small improvements to their insulation and window performance, and tightened up on air-sealing a little bit. The house (and household) performed extraordinarily well during its first year of operation in 2012, “beating” the PHPP (Passive House Planning Package) energy model prediction by 10% (beating the PHPP is the energy nerd version of “beating Wall Street” for stock market investors). So, what’s it like to live in a Passive House? Well, you could call up Jeff and Joey to ask them…or better yet, you could rent out the lower level apartment for a night or two! The apartment is available as a nightly rental through the AirBnB service for significantly less than you’d pay for much lower quality hotel accommodations a couple of blocks away. Enjoy! 2014 update – the house was recently featured in a case study by heat pump manufacturer, Mitsubishi Electric. Check it out here.